I have always been a person who just loooves colourful things, and I need a pop of colour in everything around me. Though in case of makeup black (for eyes) is a classy colour which defines the eye, but in summer a pop of color is a must! If you want to look fresh and vibrant! 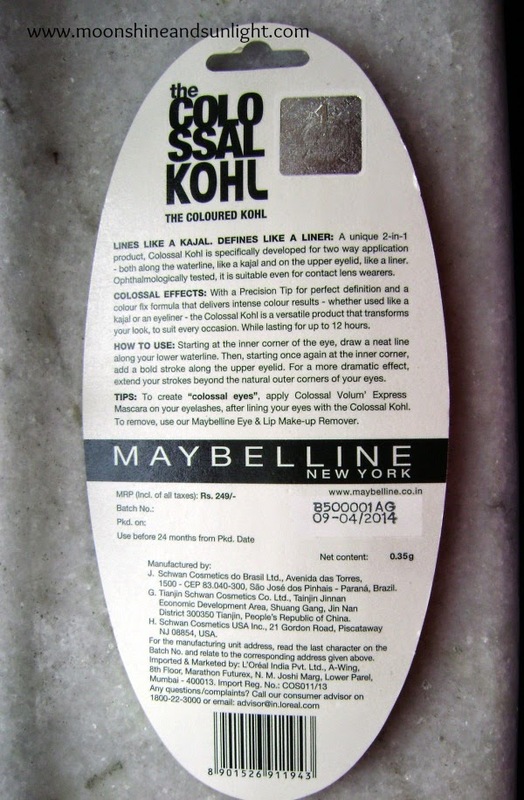 And in this case a product like the Maybelline New York’s “The Colossal Kohl”! 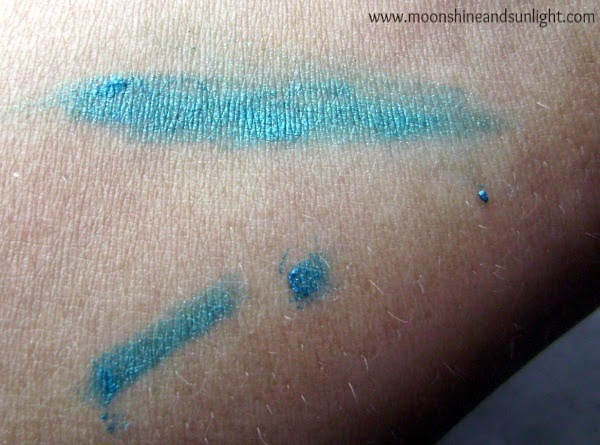 This is a bright, slightly metallic turquoise coloured Kajal! 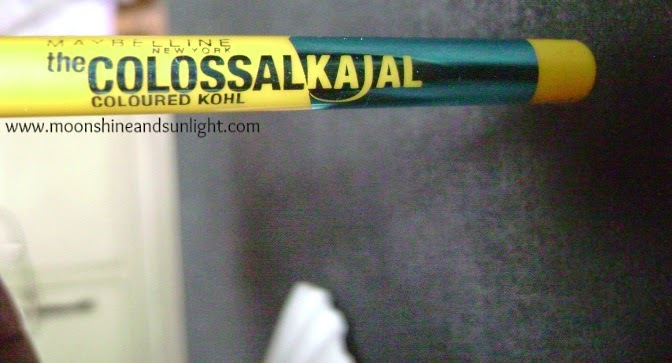 I give full mark to Maybelline for this color, because I have not seen this color in any other Kajal yet in the Indian Market! And it is Unique! Read on if you want to know more about this product. This is a new launch by Maybelline, and I am really happy to see a product related to eye makeup. And that too, when it is the perfect time of using it. As, soon as I saw this I just had to get it.Now let’s get on with the review. 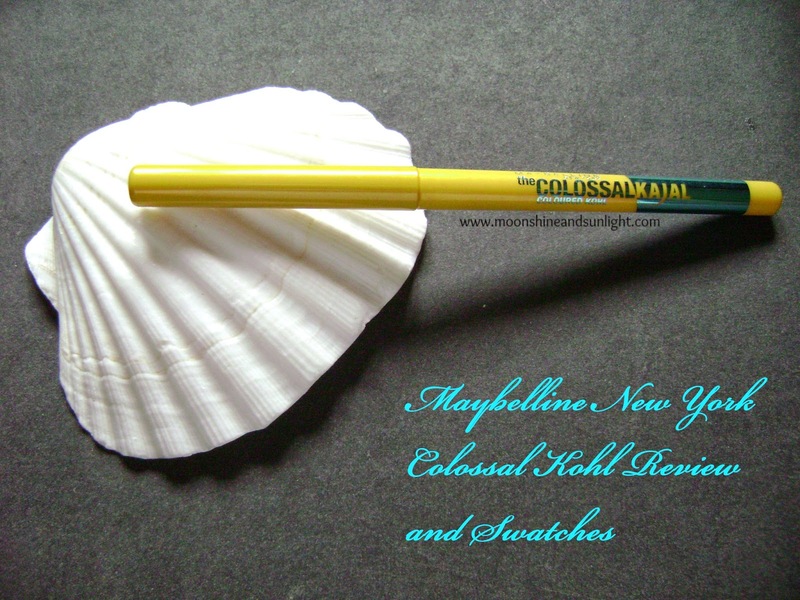 Package: - The Colossal Kohl comes in a sleek yellow pencil with a click cap in yellow color. 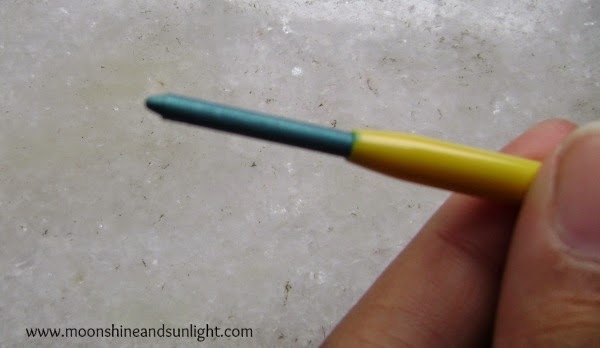 The yellow pencil is shiny and has a metallic turquoise arrow made at the bottom which I like as it would be easy to differentiate between Colossal Kohl and kajal! You have to rotate the body to take out the liner. 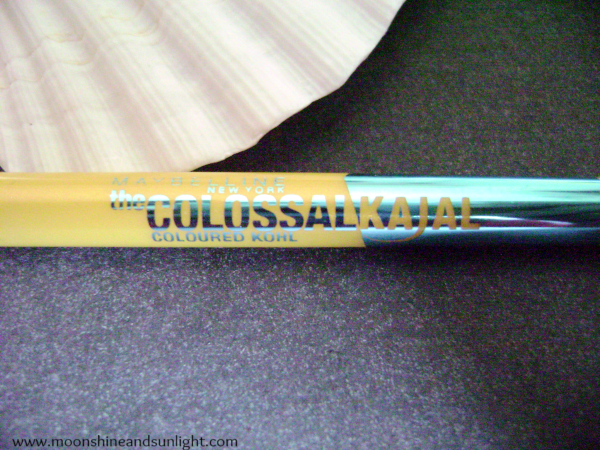 Product: -The pencil is like the standard colossal kajal, you have to twist it up to apply. The texture is not that smooth and does not glide. Needs multiple swipes on the water line as well as on the eye lid. The product is very soft and breakage is possible, leading to product wastage. I broke a little bit! The amount I have here in the picture! 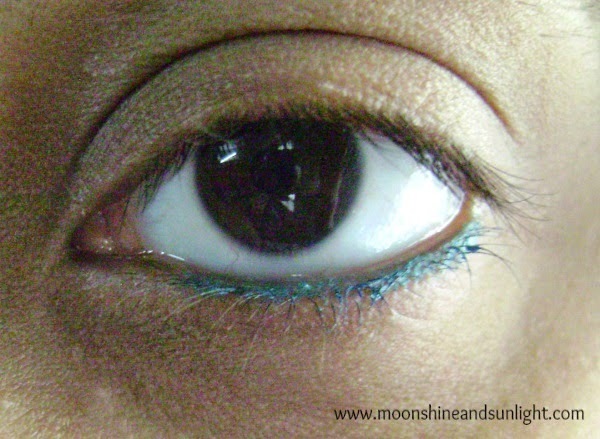 Colour: - Metallic-y turquoise blue, I fell in love with the color the instant I saw it. Contains a lot of shimmers to make it metallic, but they are subtle and not over the top. My experience: - A slight irritation happens when applied on the water line, in my case it turned into slight burning the first time I applied. When applying on the water line it gets stuck with the eyelashes. Stays for around 3 hours on the waterline, so I would say it has a decent stay on the water line. On the lids it stays for good 6 hours with the metallic sheen and then starts fading. As far as the smudging is concerned, it is good as it doesn’t get smudged easily, even after a long time it stays. No mention of ingredients also make this a little bit of risk! The texture could have been a bit more buttery. 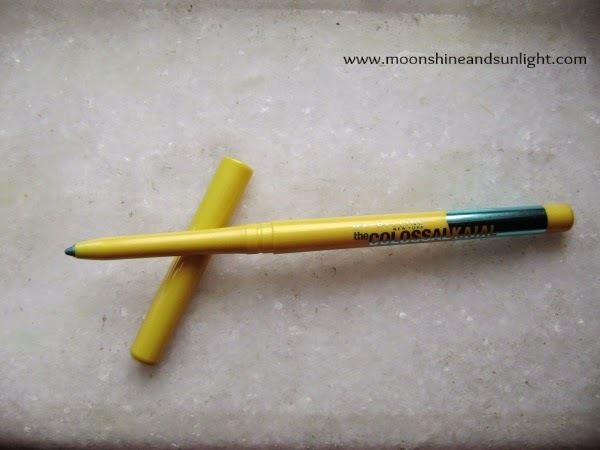 And wish the precession tip could have been maintained, but since it is a product where we have to twist it up, so, no complains Maybelline claims that this can be used both as a liner and a kajal, but for me it was better as a liner. Since I am in love with this color and also the packaging, I would ask you to check it out once, but I won’t Highly Recommend it. Have you tried this ?? what do you think ?? Love the color ?? Nice shade! Tingling in the eyes sounds a lil bothersome though! Yeah , that is a point of concern ! I love the shade so much.. Getting it soon.. well reviewed! I love this shade.. but that burnings sounds wary !